Donatella lost her battle with cancer tonight. She had been fostered for two weeks by someone who loved her and returned today to SaveABunny because of medical concerns. She died shortly after she returned in Rob's and my arms and surrounded by the bunnies and energy she knew. She was an exquisitely beautiful bunny and we only wish her previous guardians had spayed her, for she might have been alive today. She had rough life, but we loved her and will really miss her quiet, sweet spark of energy. 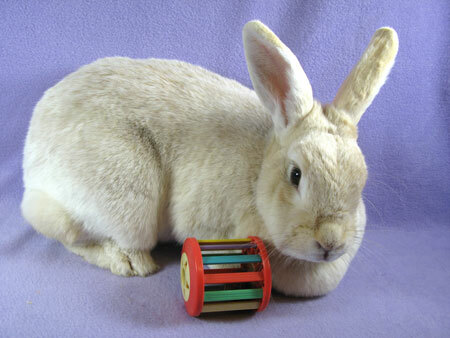 Donatella is a very brave bunny with a strong will to live. We discovered a large mass on her chest, which was determined to be cancerous. On Saturday, Oct 31, she underwent emergency surgery with the wonderful Dr. Debra Scheenstra, who removed a significant amount of tissue in an attempt to isolate and remove the cancer. Donatella is recovering well, showing interest in fresh greens and looking perkier than expected. This big girl bunny has had a rough life and truly deserves to be pampered and adored. When she heals from surgery, please consider adopting her and giving her the special, forever home and love that she craves. If you'd like to make a tax deductible donation to help with Donatella's expenses and care, we would be very grateful and it will help us to continue our life-saving work. Hello Darling. My name is Donatella and yes, I am a fashionista. I am a very fancy, designer type bunny. Have you ever heard of a Creme D'Argent rabbit? I am the type of bunny that some people like to show at rabbit shows. I am GORGEOUS. Big, plush, and very elegant. Rabbits like me are typically bred for our thick, lustrous apricot colored fur. I am so happy to be safe and at a place where I am loved for who I am and not what I can be used for. I arrived at a shelter after my human passed away. I was scared at first, but am doing very well now. I am ready to be loved and love you in return. If you want a special companion who is both beautiful and engaging---that's me.